Learn more about homes for sale in Spencer County KY. Spencer County borders Shelby Co. to the North, and Jefferson and Bullitt Co. to the west. With a population of almost 18,000, Spencer County has nearly tripled in size since 1990. During the span of 2000 to 2005, it has ranked 19th of all U.S. counties in percent growth. A great reason why many love to call this area their new home. Below you will find all of the newest Spencer County MLS listings for sale. Welcome to Spencer County, Kentucky. founded in 1884 and named after Captian Spier Spencer. The county seat is the city of Taylorsville. Home of Taylorsville Lake. A popular 3,050-acre lake which is the largest lake in the Louisville Metro Area. Taylorsville Lake features a full-service marina and an adjoining 1,200 acre Taylorsville Lake State Park. As the population in Spencer County continues to expand - we proceed to see a demand for real estate in Spencer County. People continue to relocate to the area and in return, the housing market is growing rapidly. Over the years, houses for sale in Spencer County rise at a steady pace. Recently we have witnessed homes going under contract within days of being listed on the local MLS. There are great parks to visit in close proximity to the area. Many local residents enjoy visiting Taylorsville Lake on the weekends during the Summer months. 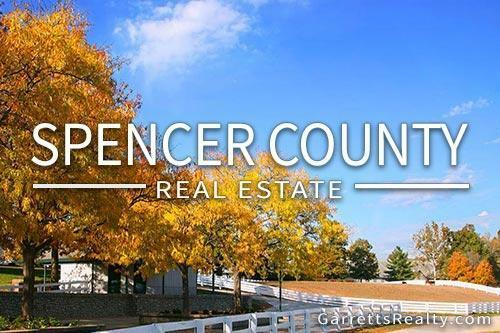 If you are new to the area and looking for a home for sale in Spencer County, you will quickly experience, first hand, how great this area is. From quiet country roads to a rural ambiance setting. It’s no wonder why so many love calling Spencer County home. Pros of Living in Spencer Co.
As you may know, there are a lot of benefits to owning real estate in Spencer County. Below we highlight some of the benefits to owning property here. Taylorsville Lake -One of the most popular l, and largest lake in the area. More than 3,000 acres! Taylorsville Lake also features a full-service marina and connected to a state park. Great Small Businesses -Many residents are very supportive of the local businesses here in Spencer County. As a newcomer yourself, be sure to support and visit some the small businesses around the area to discover what they have to offer. Sustainable Economy -Over the last few years Spencer County has seen great growth. Population has grown significantly, new construction has also been on the rise here. Unfortunately, there are some drawbacks when it comes to buying a house for sale in Spencer Co. Below are some of the negatives that you may run in to. Location - Longer Commute -Longer Commute -The average drive to work is roughly 30 to 45 minutes. Located roughly 25 miles southeast of Louisville. One major drawback if you like living close to the city. Places to Eat -You will quickly discover that sometimes you'll have to travel into Louisville in order to find something new from time to time singer restaurants are limited in Spencer County. Gene Snyder Traffic -In your commute to and from work, you will notice a bottle beck of traffic on Gene Snyder. Especially near the I-64, which is not far from the Taylorsville Rd exit.